Between giant statues, early access, and art books, there's quite a bit of booty available for those who can't wait for Guild Wars 2. After recently confirming a 2012 release for the highly-anticipated sequel to 2005's Guild Wars, ArenaNet has gone a step further by showing off exactly what treasures await those willing to shell out for its monstrous Collector's Edition. For a mere(?) 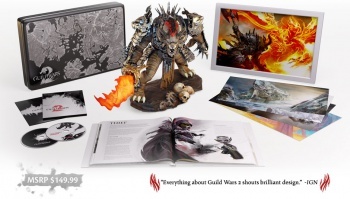 $149.99, buyers will get a 10-inch figurine of the flame-sword wielding Rytlock, a 112-page Making of Guild Wars 2 book, a CD soundtrack including the best of Guild Wars 2's orchestral stylings, an art portfolio, five art prints, and a custom art frame. And that's just the stuff players can put their grubby little mitts on. Collector's Edition owners will also receive a trove of digital items, including the "Summon Mistfire Wolf" elite skill, a miniature Rytlock (one can never have enough Rytlock, it seems), the Chalice of Glory, the Tome of Influence, and your very own Golem Banker, which ArenaNet describes as a "mechanical man servant" willing to serve you for five days. One also assumes you get a copy of the game. If you're eager to secure one of the limited number being produced, you can pre-purchase the set beginning April 10th. Doing so also gives access to yet another round of swag and perks, including the Hero's Band (which provides +2 Power, +2 Precision, +2 Toughness, +2 Vitality, +2 Condition Damage, +2 Healing, and +2% Critical Damage, but sadly no fantasy-themed musical instrument peripherals), access to all Guild Wars 2 Beta Weekend events, and a three-day head start, so you can scoop up a screen name other than xXxdarkpantherassassinofthenight928337xXx and call people n00bs when they get started 72 hours later. If you like the idea of getting the Band, the beta, and the head start, but either aren't into multiple iterations of Rytlock, mechanical man servants, or searching out $149.99 from under the couch cushions, you'll be happy to hear that the pre-purchase perks apply to the game's Standard Edition as well. As for when you'll be able to actually play the thing? According to the website, "when it's done."